This is another great recipe from our Brooklyn Italian Grandmother. It is quick, simple and delicious. It is perfect for a weekday supper when you don’t have a lot of time to cook. It also doesn’t use a lot of dishes which is great at clean up time. We call it cauliflower macaroni, but feel free to use broccoli or zucchini if you like. Our Brooklyn Italian Grandmother has made this recipe for quite a while and it is one of our favorites. Our recipe makes a generous portion. It feeds 4 to 6 people, depending on how hungry the crowd. There is something so good when you keep the ingredients simple and fresh. However, while the dish is simple and delicious, feel free to jazz it up with a few pieces of jewelry like our Italian Grandmother always does. 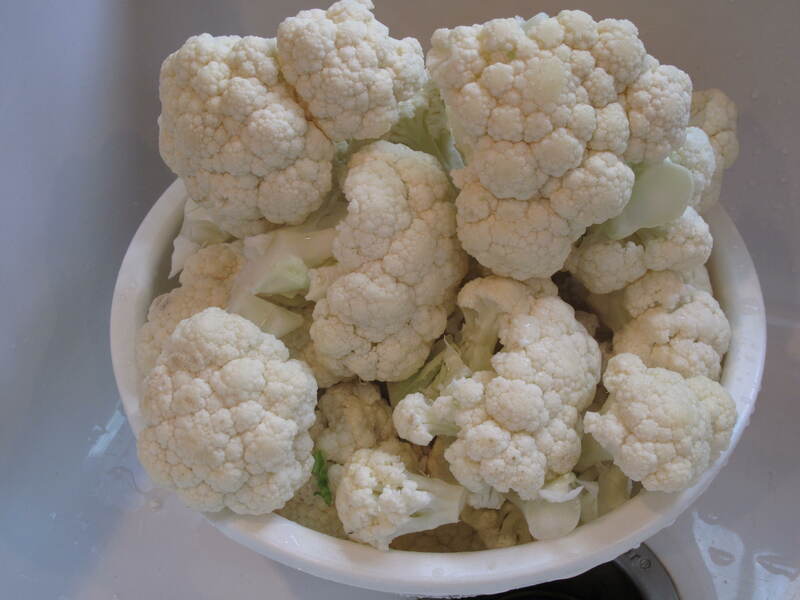 Clean cauliflower by separating each floret from the stalk and wash under cool water. Don’t worry about the size of the florets because they will break down when mixed with the cooked pasta at the end of the recipe. 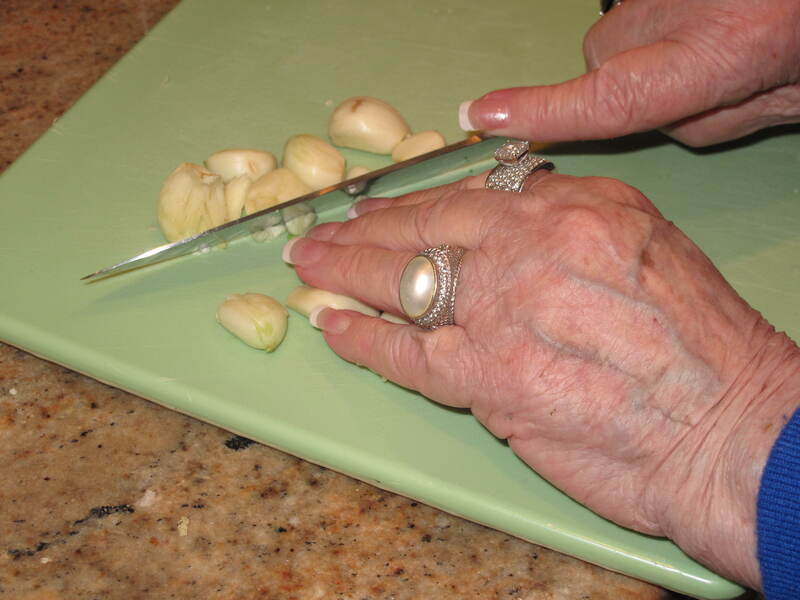 Clean and chop garlic cloves into small pieces. Hot Spring trend…pearls, diamonds and garlic. 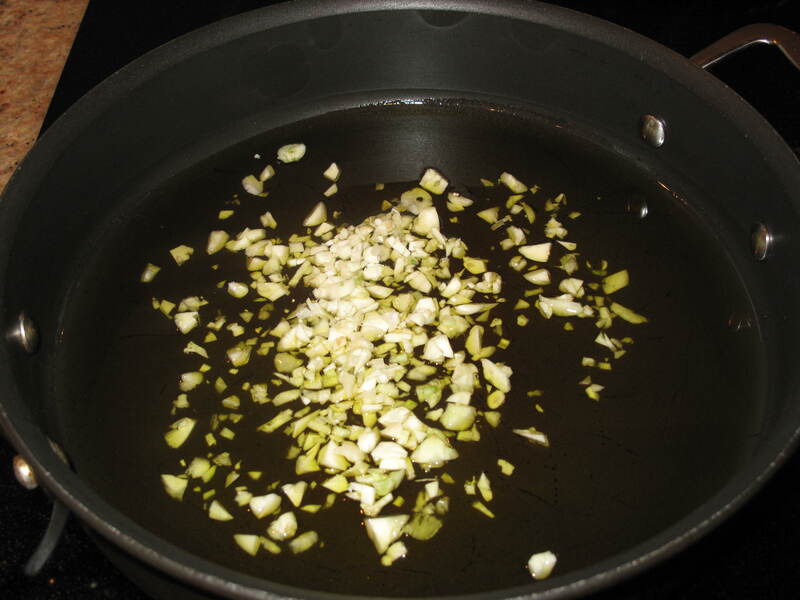 Heat olive oil in a large skillet and add garlic. Sautee garlic until it is a golden color. Add cauliflower. Fill the pan with plenty of cauliflower as it will cook down. A trifecta….three rings in one shot. Isn’t that Catherine Middleton’s engagement ring on one of our Italian Grandmother’s fingers? Add chicken stock and the chicken bouillon cubes. Diamond ring alert at 12 o’clock. 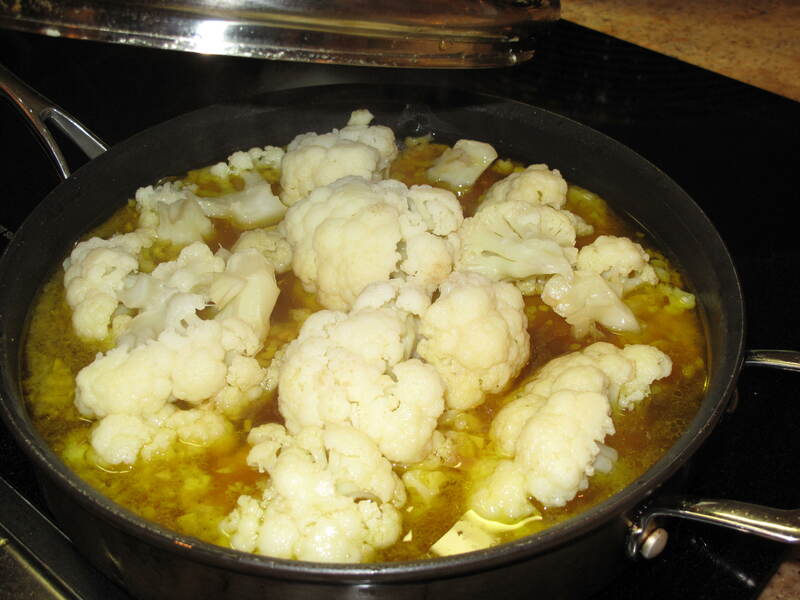 Place a lid on the skillet and simmer the cauliflower in the stock until it is very tender. You can do this ahead of time if you would like. 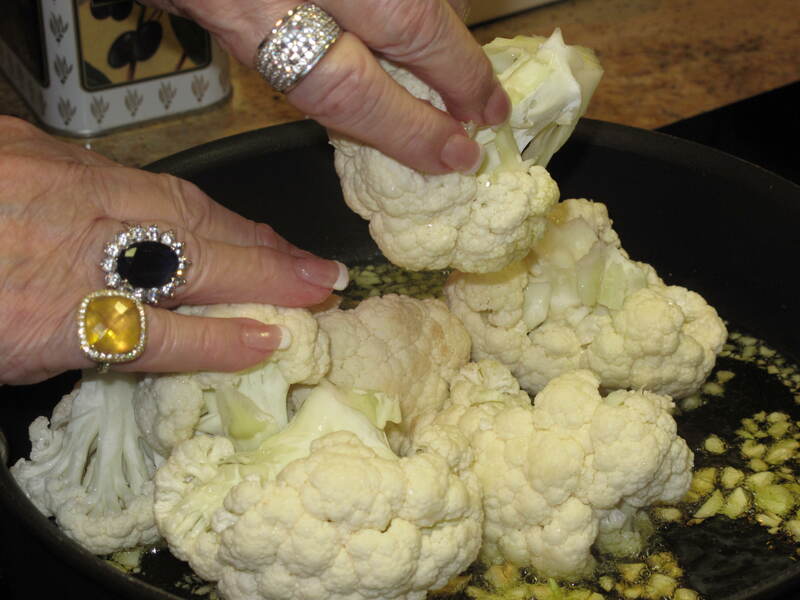 When the cauliflower is tender, remove it from the burner and set it aside or use it immediately. If you do set it aside, make sure to reheat before you use it. 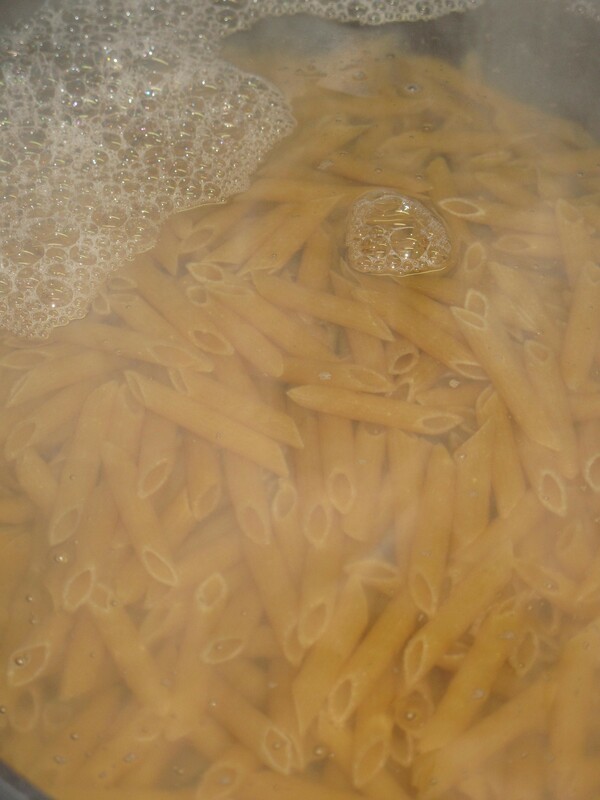 Place pasta in boiling salted water and cook until done. Drain the pasta and return it to the pan. Place the cauliflower and broth on top of the pasta and mix with a spoon. 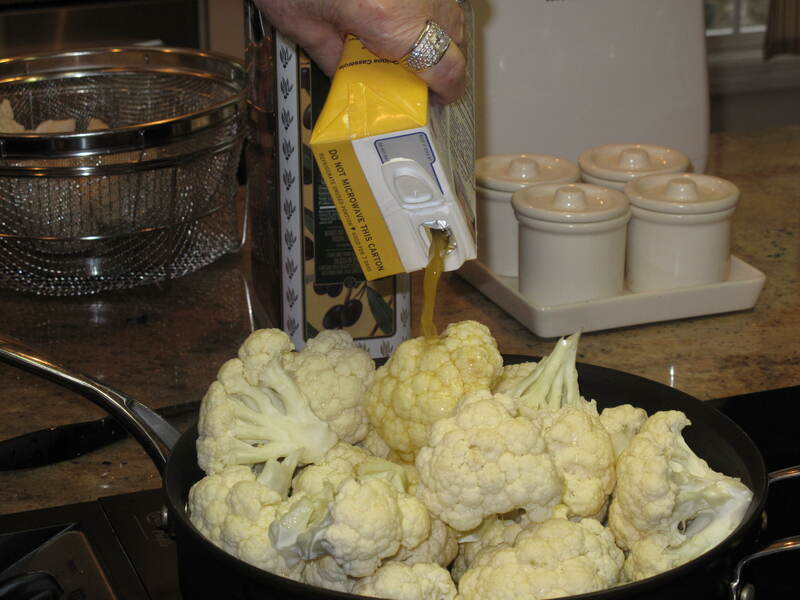 When mixing, the large cauliflower florets will break down into more manageable pieces. 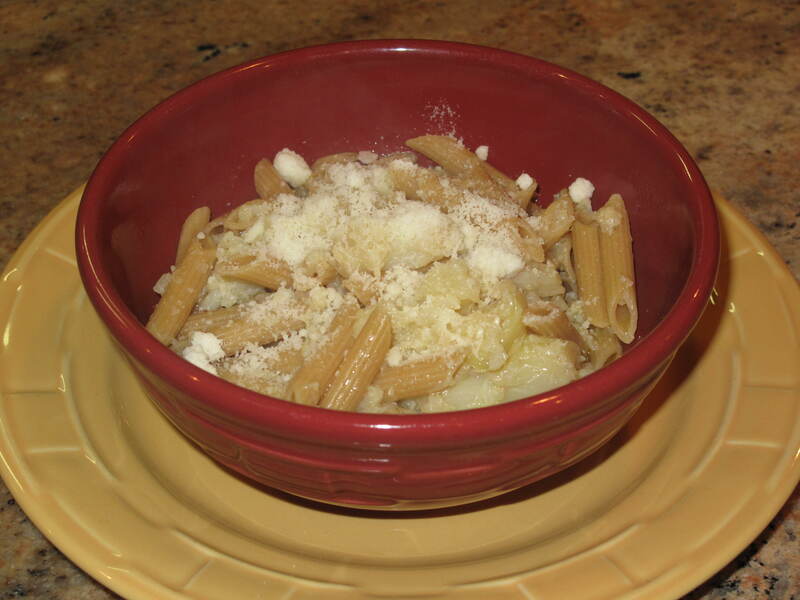 Serve the pasta with plenty of grated Parmesan cheese and red pepper flakes on top. The pasta is so delicious because there is rich chicken broth at the bottom that is so flavorful after being simmered with the browned garlic. The garlic and the stock also add so much flavor to the cauliflower as well. The grated cheese and red pepper flakes also add their own special kick. Again, if you are not a lover of cauliflower, try using broccoli or zucchini instead. We’ve used them all and the dish is always good. The worst part is this–do you use a spoon (for the broth), a fork (for the pasta/cauliflower) or both? Do you have any easy pasta dishes that you would like to share on Acorns On Glen? This entry was posted in Food and tagged Acorns, Blog, Cooking, Family, Food, Fun, Love, My Life, Photos, Recipes. Bookmark the permalink. This is definitely a family recipe. Cheese to taste, roughly this much garlic. Looks tasty! Thanks!! We love it. Hits the spot and is quick to make. Thank you for posting! My mom and grandmother (from Brooklyn, of course) made this all of the time, too! I googled it instead of calling my mom for the recipe. Thanks again!! 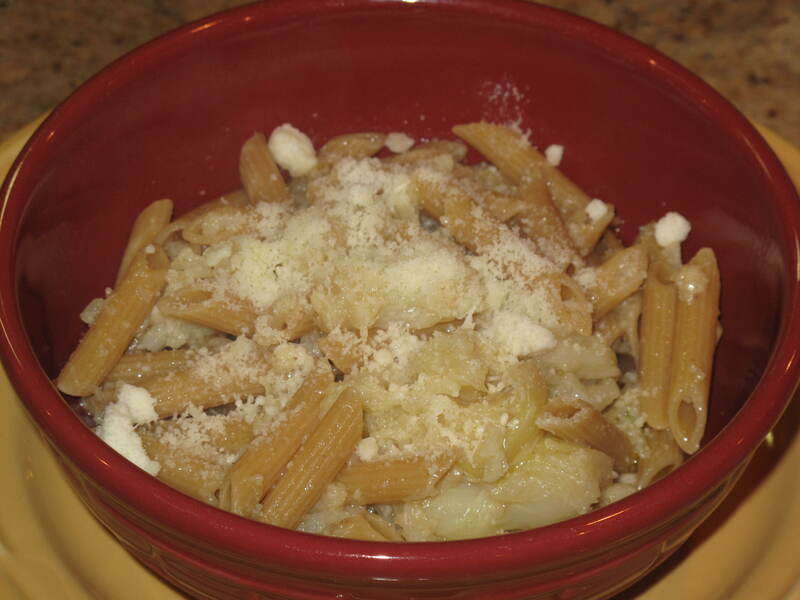 You must try pasta with cauliflower, anchovy, garlic and parmesan. buonissimi! love it , Son still looking for a sauce, told him chicken broth is the sauce.